A reticulated, open cell polyether based polyurethane foam. Category: Aquatic Filtration, Aquatic Filtration, Reticulated Polyether Foams. 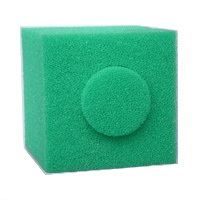 DESCRIPTION : A reticulated, open cell polyether based polyurethane foam. 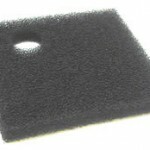 Has excellent resistance to water and humidity, and is therefore ideal for water and air filtration. The calibrated cell size and homogenous cellular structure allow these materials to be used in biotechnological and environmental applications; the high surface area of the foam supports the growth of micro organisms. These filter foams are resistant to mild acids and alkalis, salt water, fuel, organic chemicals, oils, lubricants, soaps and detergents. APPLICATION : Industrial waste water treatment, water pollution control, mechanical filtration and pre-filtration of air and water. Although ideal for water filtration, polyether filter foams are also suitable for humidifiers, ventilation systems and acoustic foam for loudspeakers. The large porosities (10ppi and 20ppi) are also used as fuel tank baffles. These foams can be washed and rinsed for re-use many times.